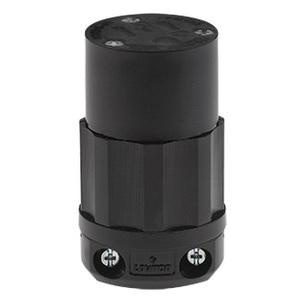 Leviton Black & White® 3-Wire, 2-Pole, industrial grade, polarized straight blade connector features thermoplastic back cover, nylon wire module, nylon cord clamp, nylon clamp insert, brass terminal screws and zinc-plated steel assembly screws, which resists impact, corrosion and chemicals. It has voltage rating of 125-Volts and current rating of 15-Amps. All contacts are solid 1-Piece brass for superior conductivity. Straight blade connector is UL listed, CSA/ANSI certified and NEMA rated.